A Whole Lott More premiered at the Cincinnati Film Festival. Cincy Chic: Tell us more about the story behind the film “A Whole Lott More”! Victor Buhler, Director of “A Whole Lott More”:Around 80 percent of Americans who have developmental disabilities are unemployed. But it doesn’t have to be this way – finding jobs for many people with disabilities would improve their lives, would make them more visible and prominent in our wider society, would make for a more inclusive world and, with the right approach, could even benefit taxpayers. 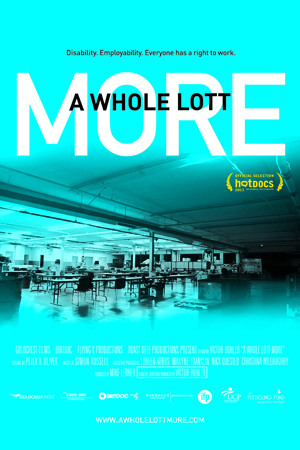 “A Whole Lott More” looks at this issue through the prism of Lott Industries in Toledo, Ohio, which for many years was one of America’s most successful workplaces for people with disabilities. Lott specialized in assembling car parts for the auto industry and was a Tier One supplier. When Ford moved away from Toledo, Lott lost its main contract and – like so many area businesses – has been forced to take a different approach. ‘A Whole Lott More’ follows Lott’s story and focuses on three incredible individuals with developmental disabilities and their quest for the right job. Cincy Chic: What inspired Lott Industries to do what they do? Buhler: Parents of kids with developmental disabilities founded Lott Industries in 1955. At the time, there was little precedent for providing jobs for people with disabilities and these parents wanted to give their kids a place to work. While Lott is historically one of the most successful workplaces for people with developmental disabilities, it is far from unique. In every community across Ohio and across America there is a workplace for people with disabilities – some are more successful than others. There is also controversy surrounding many as they are often seen as too separate from the wider community. Cincy Chic: Why did you decide to make U.S. premiere at the Cincinnati Film Festival? Buhler: We decided to hold the U.S. premiere of “A Whole Lott More” because the Cincinnati Film Festival is the closest film festival in Ohio to Toledo, where the film is based. We knew that the three stars of the film – Wanda, TJ and Kevin – had an opportunity of coming to the screening. “A Whole Lott More” is really their film and their story. It’s a gripping story of Midwestern spirit and determination. Cincy Chic: How did you decide to aid disabled adults? Buhler: As a filmmaker, I became interested in disability issues following a car accident which put me on crutches for a couple of years. While I could not compare this to having a permanent disability, the experience gave me insight into the disability world. The lack of employment opportunities for people with disabilities shocked me and that’s a situation that I, as a filmmaker and a person, am determined to change. Cincy Chic: Where can readers go to learn more about “A Whole Lott More”? Buhler: Please visit www.awholelottmore.com and sign up to our mailing list. We are also on Facebook and Twitter.